Thanks so much, can’t wait for the rest! Keep up the good work! When I originally printed mine off, I made a diagonal line inside the box. When a child had mastered the skill, I wrote the date in the box. Each child had a bright yellow folder in their desk that said”I CAN” on the outside of the folder. On the inside of the folder, I wrote” Class” on the left hand pocket and on the right hand pocket I wrote “Self”. I had Special Ed students in my class and I wanted them to feel successful as well as the regular ed students. At the beginning of the year, the students chose several things that they COULD do along with things that were goals. I took lined paper that had a large box on the top for a picture and then the words “I Can” on the lines. The students could then write and / or draw their I Can statements. Fantastic idea!! 🙂 Great for goal-setting!!!! I absolutely LOVE everything about this website! I graduated from IUPUI with my Elem. Ed. degree in December and as I anxiously await a classroom to call my own I find myself going to your website to create binders and activity folders for the day I finally get my own class! 🙂 Thanks for taking the time to put this fabulous site together! Do you have the I Can statements and posters for 3rd grade? Here is the link to all of our I Can posters! These will be so helpful to both me and my students. Thanks so much for sharing them! These are so student friendly. It’s an awesome resource for someone like myself who is just starting the Core. Thanks! Thanks SO much. I love that our community shares! You’ve done a fabulous job and I appreciate the time you’ve spent. Thank you so very much!These are great! Do you have third grade common core with the borders? Here is the link for all of our I Can standards! I see the check list for teachers…but no the I can’s for other grades…I need first?? Thank you for all the effort you’ve put into creating these “I Can” statements. Our building wants to use them as a communication with parents. Which leads me to ask…. “Do you have them written in Spanish by any chance?” If no, do you have any plans in the future to translate them into Spanish? Thank you!!! Your website is a great resource!!! Hi Debby! We have this in the works for the 1st through 3rd grade standards right now and should have them ready by the end of the summer, if not sooner. 4th – 6th may take a little longer because they are a little more in depth, but we have a very enthusiastic translator, so who knows?! Keep checking back! Thank you so much for this site! It is wonderful! I am wondering if you can help me locate a scope and sequence for the reading portion of the common core standards. I don’t know if I am missing it or if there is one at this point. Thank you for the wonderful resource. I am looking forward to using them in my class next year. I WOULD LOVE THESE IN SPANISH! CAN’T WAIT UNTIL YOU HAVE THEM TRANSLATED. Hi Veronica! We have a friend working on translating the primary “I Can” standards right now! Keep checking back! Anyone having trouble opening the links? When I click on the link, it will open a new tab, but appears blank. I have tried 2 different browsers. Not sure why that is happening, Katrina. We know the links work because we’ve checked them. Have you tried clicking the refresh button once the blank screen comes up? I know I had to do that at school to get the links to work (but not at home). Thanks for sharing. I love the posters – they will make posting the statements so much easier. I am a dual language teacher and my partner is wondering when the translated 2nd grade common core I can’s will be ready? We have been in session since the middle of July and I keeping cheching back but I still don’t see them. Hi Rachel! Sorry, but we’re still waiting on our contact to get those finished. She is a working mom and is very busy too. We have been following up and will hopefully have some grade levels up by the end of the year. Sorry! Thanks quite o.k. My partner will probably take on that challenge of translating them on her own. We were just thinking of maybe using them as progress reports and adding a meets or does not meet in the square to send home to parents. I just wanted to Thank You for such a great website. I am the dual language (English Teacher) so I don’t have a problem finding good resources like your website, but she has the hardest time finding Spanish materials and resources. Again, Thank You for all your hard work! Thank you SO MUCH! I’ve told many people about your website because it’s AWESOME! I just discovered your page through a friend at school. I’m reading the comments and discovered they will soon be in Spanish…no I’m even MORE excited. Is the translation complete? Hi Monica! She’s working on first grade right now. Second grade will be coming! We will make sure to get the word out when they are finished. Check Pinterest and our Facebook page for the announcement when they are ready! We’re excited too! Do you have Science I Can Standards? Hi Kathy! It’s on our list of things to get accomplished. We will use the Next Generation Science Standards since they haven’t been developed by corestandards.org (yet). Thank you so much for all your hard work on the “I Can”!! I love them. First of all, I wanted to thank you for posting this great CCSS help for everyone, especially, making the effort to translate it into Spanish. There are hundreds of Dual language elementary school programs that benefit from having the I can statements in Spanish. However, as a friendly suggestion: the translations need proof reading from someone fluent in Spanish. There are several errors (from a web translator?) that can easily be corrected. Since it is not an editable file, there is not much I could do. I hope you do not take this in a negative manner, I am sure you have tried you best. Hi Angelica! Thanks for your comments. We didn’t use a web translator, but a colleague who is a native English speaker. We are going to temporarily pull the Spanish versions until the mistakes can be fixed. So sorry! They will be up as soon as we can get them corrected. I love the checklist with the border, however when it printed there were some scrambled letters at the top and with the web address at the bottom. Any ideas why this might be happening or if the file is possibly corrupt? I’d love to use these if I can get them printed correctly. Hi! Your computer or printer is putting that on when you print. Our files do not have that – check your computer settings. We hope this helps! OH I LOVE IT! This is just what I was going to try and create. I don’t have to now. Thank you, thank you, thank you!!!!! Hi, Am anxiously awaiting science “I can” statements. Any place I can go for ideas and activities? Hi Lorri! We actually are just getting started on the NGSS. We will begin with first grade and then move up. Hoping to have all of these posted by the end of the summer at the latest…hopefully sooner! Do you know when you will have the statements in Spanish? Hi Michelle! We are currently working on updating all of our I Can statements to incorporate recent changes and to better organize and streamline them for our followers. We are also planning to create new colorful and trendy posters for classrooms! Looking for it all to be done by the end of June – including the Spanish translations! We are very excited! WOW! I love these! Thanks for all your hard work! Please let me know when the spanish ones are done for 2nd grade. Will do, Lori! They are actually translated, but we need to get them onto the posters. Hopefully by the end of this week! I downloaded 2nd grade statements in a blue rectangular box. I really like those. Do you still have those? Where would I find them? I have looked everywhere. Thanks. Hi, Susan! 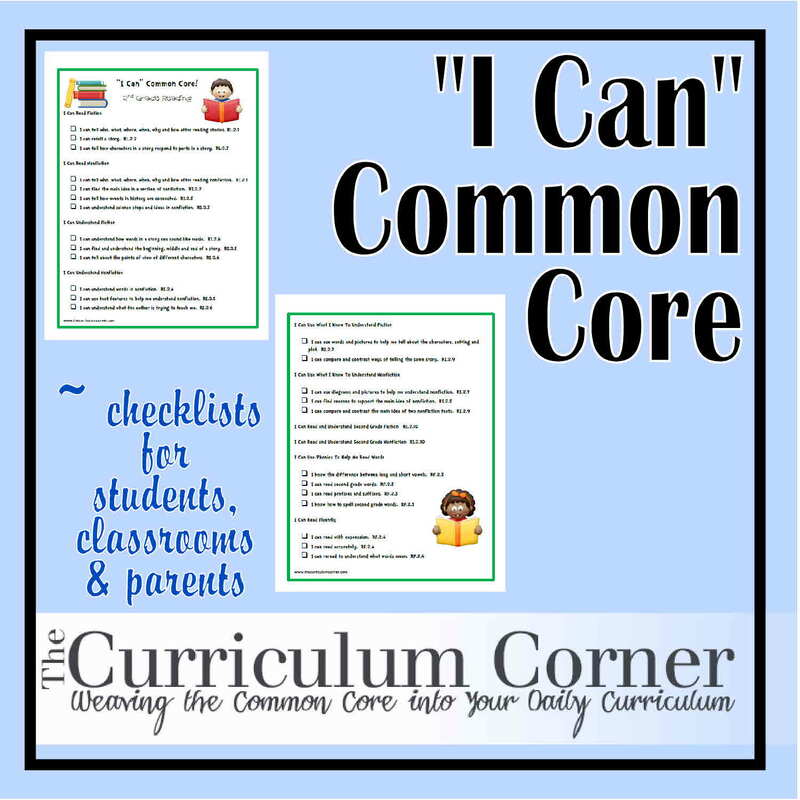 Here is the link to all of our 2nd grade resources: http://www.thecurriculumcorner.com/thecurriculumcorner123/2014/08/22/everything-i-can-common-core-for-2nd-grade/. We have had to remake our materials as there have been a great deal of changes to the CCSS and our resources were no longer accurate. Can I down load the I can statement for grade two? Hi Ezinwa! Yes, all you need to do is click on the underlined/highlighted link for the free downloads! Email us if you still have difficulty! Love this website. Thank you!